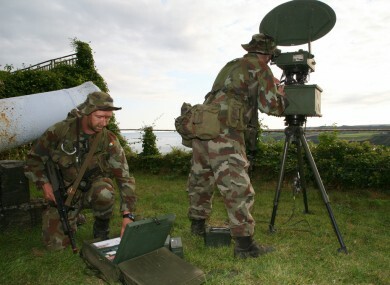 File photo from 2007 of Defence Forces troops using ground radar. Ten similar units, made by Israeli companies, were bought in the past two years. SINN FÉIN HAS called on the Department of Defence to stop buying Israeli-made military equipment. The former Defence Minister Alan Shatter said in May of this year that since 2011, €2.9 million has been spent on such equipment, mainly a set of ground surveillance radars. “Such tender competitions are open to any individual company or country in accordance with the terms of all UN, OSCE and EU arms embargos or restrictions,” he said. According to a Sunday Tribune article from 2010, €14 million was spent on such military equipment made by Israeli manufacturers between 2004 and 2009. Now Sinn Féin’s justice spokesperson Pádraig Mac Lochlainn TD has called on Minister for Defence Simon Coveney to stop any future sales. “The importation of military equipment from Israel sends a clear message of approval for Israel’s military aggression, including its war crimes and possible crimes against humanity,” Mac Lochlainn said in a statement. Ireland should not be buying any military equipment, or trading with, a country that is massacring civilians and enforcing an illegal and brutal occupation on millions of Palestinians. Another demonstration is underway Dublin this afternoon against the conflict in Gaza. Organised by the Ireland Palestine Solidarity Campaign, singer Damien Dempsey will perform at the end of the march at Israeli embassy on Pembroke Road. There will also be a live phone link with Dr. Bassel Abuwarda of Al-Shifa hospital in Gaza. Meanwhile, a UN official has said that a seven-year blockade on the Gaza Strip must end to enable reconstruction and a political solution must be found to resolve the conflict. The blockade must end. We are beyond the realm of humanitarian action alone. All those directly and indirectly responsible for the carnage and destruction must engage. The lifting of Israel’s land and sea blockade, imposed in 2006 after Hamas captured an Israeli soldier, has been a key demand of Hamas and the Palestinian Authority at stalled truce talks in Cairo. Israeli warplanes has carried out 30 air strikes over Gaza today, killing five Palestinians, as militants fired six rockets into Israel, leaving international mediators scrambling to rescue ceasefire talks. Email “Sinn Féin wants Ireland to stop buying Israeli-made military equipment”. Feedback on “Sinn Féin wants Ireland to stop buying Israeli-made military equipment”.